« Killer Sudoku on Saturdays! Some people consider Sudoku Samurai puzzles too big; some other people prefer even bigger puzzles. 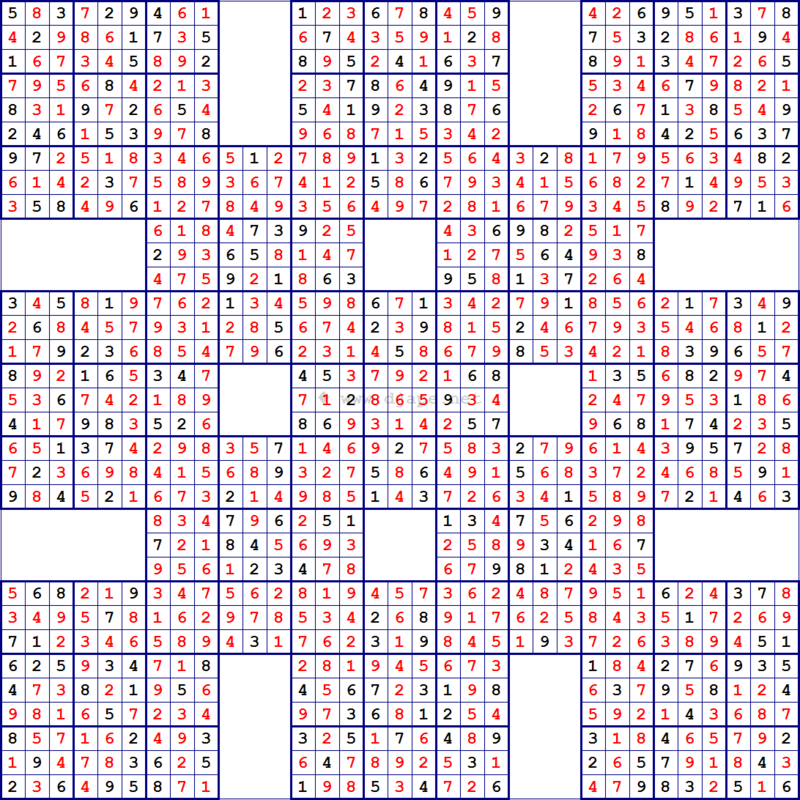 If you belong to the second category, here is an overlapping sudoku variants puzzle for you: 13 grid Sudoku (Gattai-13) laid out in a quadruple Samurai Sudoku format. 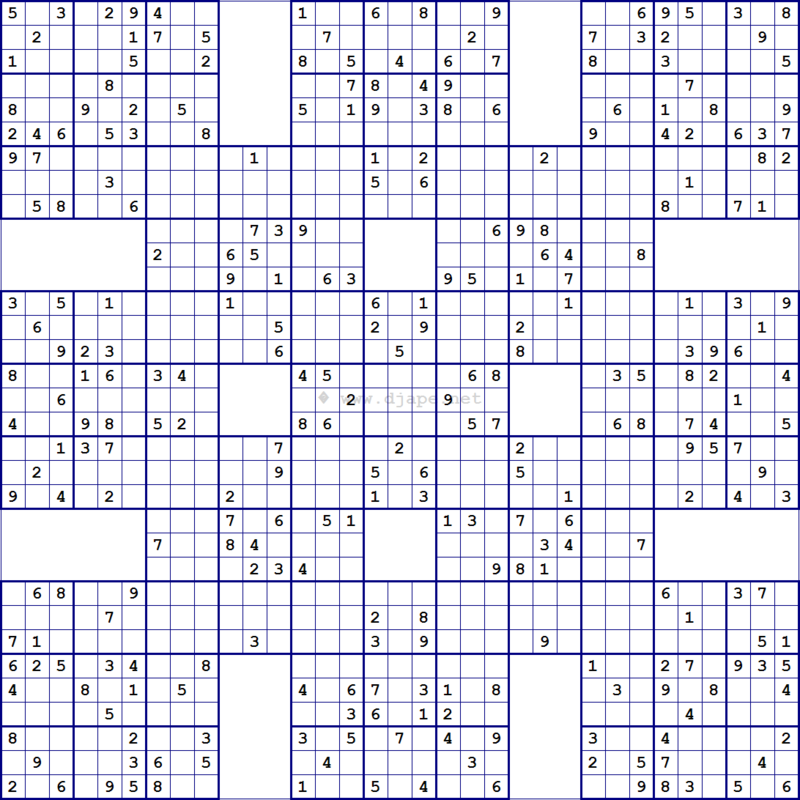 Essentially, there are 13 Sudoku sub-puzzles which overlap the same way as in Samurai Sudoku. So it is like having 4 Samurai Sudokus on top of each other! Or, 2 Sudoku Harakiri puzzles side by side! This entry was posted in Free sample puzzles, Samurai sudoku, Sudoku Variants and tagged gattai, harakiri, overlapping sudoku, PDF, samurai, Samurai Sudoku, Sudoku Gattai, Sudoku Samurai, Sudoku Variants, Super Samurai, Super Samurai Sudoku, variant. Bookmark the permalink. Post a comment or leave a trackback: Trackback URL. This puzzle format is usually referred to as a sumo. I like the multi-grid puzzles for occasions when I have more time to kill (doctor’s office, etc.). Yes, please keep making these! Could we get a version that can be opened and solved in a spreadsheet? If it’s already available, how do we download? I would be very interested in seeing a version with diagonals. These tend to be tougher, so it would be a great challenge!